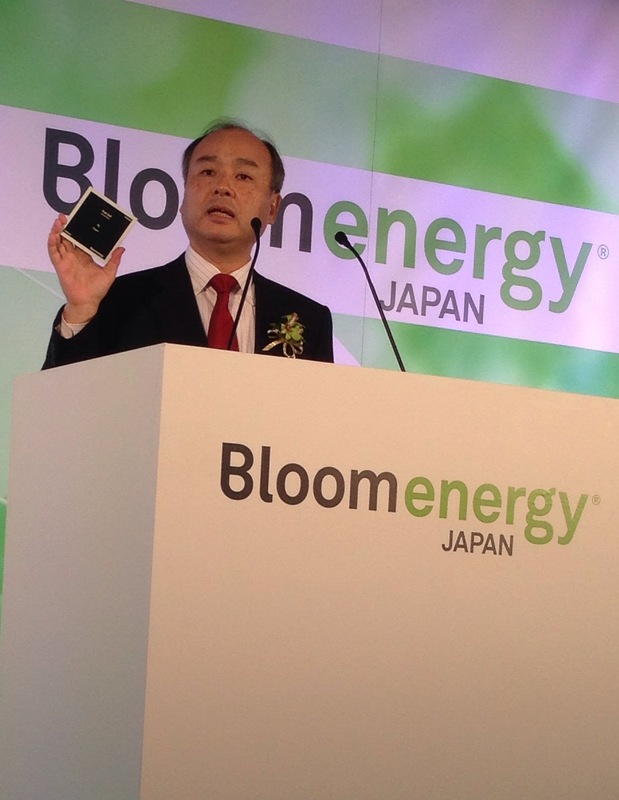 Silicon Valley fuel cell startup Bloom Energy has installed its first fuel cells internationally, at a building in Fukuoka, owned by Japanese telecom giant Softbank. It’s just a small installation, but it’s the first results from the joint venture that Bloom Energy and Softbank created earlier this year to focus on getting more Bloom Energy fuel cells deployed in Japan. Bloom Energy says it now has built out 100 MW worth of fuel cells across the U.S. — 100 MW is about enough to power 36,000 average American homes. While the company is over a decade old, it’s still a major milestone for a venture-backed startup working with a notoriously tricky technology like fuel cells. Bloom Energy is backed by over a billion dollars from investors like Kleiner Perkins and NEA. Fuel cells are large devices that combine a fuel (usually natural gas or biogas) with oxygen and through a chemical reaction create electricity. They’re kindof like electricity-generating batteries. Data center operators like Apple, Google, eBay and Microsoft, have started to experiment with Bloom Energy’s fuel cells to help add more clean and distributed power to their Internet operations. 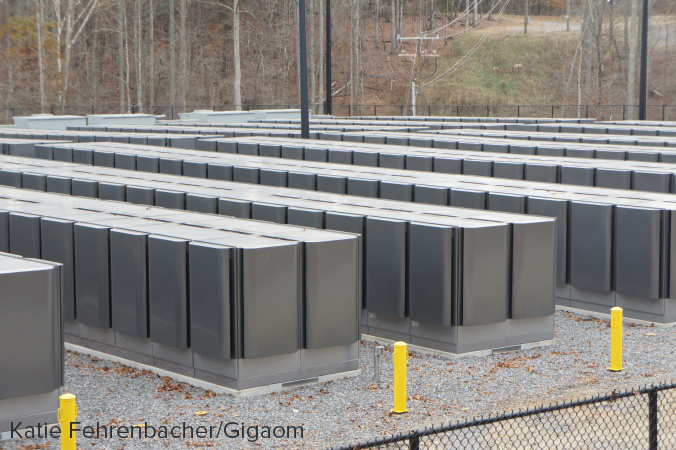 I took these pictures (also below) of Bloom Energy’s fuel cells installed outside of Apple’s data center in Maiden, North Carolina earlier this month. Japan is particularly interested in clean power options these days. After widely rejecting nuclear power following the Fukushima accident, the country is now looking aggressively at solar, energy efficiency, smart grid, and other next-gen energy options. However, because of Japan’s move away from nuclear it’s had to dial back on its carbon emissions reductions goals. Can I buy a one kw bloom cell for my home. Gasaholic, Japan prices are 26c / kwh. Please show references to your claim of 10-12 c/kwh. You are quoting residential rates I think. Commercial/industrial rates are half that cost. According to the Agency for Natural Resources and Energy, households were charged Â¥20.54 per kilowatt-hour and industries paid Â¥13.77 per kwh in fiscal 2009. Industrial price here is 13 cents. Larger companies like SoftBank do not pay residential rates, and will pay lower prices than regular industry. Sorry Hassles, they are still very expensive. They have a huge carbon footprint too. A key consideration here is the nature of the power supply – Bloom is providing onsite, uninterruptible power to Softbank, which provides security against outage and also a hedge against utiltiy rate increases, which are expected across much of Japan. Since the costs of running a bloom box appear to be more expensive than commercial or industrial rates, and since any natural gas outage will kill power from the fuel cells, I don’t really agree with you. In addition, Inverter based fuel cell systems do not, to my knowledge, have a good operational history handling site voltage, transients and grid disturbances. They tend to get kicked offline easily, and require hours long cool down and startup cycles resulting from each event. Inverters are not more tolerant to these grid or site disturbances than a more conventional rotating generator, made with much more mass and copper, which can tolerate more routine abuse without being kicked offline. It might be instructive to see some data or feedback from fuell cell customers to see if they have been seeing additional demand charges as a result of grid or site triggered inverter and fuel cell issues. At the very least, careful site selection at clients with few if any changes in load or few grid disturbances might in part mitigate these issues. 3.21 MMbtu/hr x LNG at $15.50/MMbtu/200kw = $0.1023/kw, then add the ‘warranty’ at ~$0.04 cents/ kwh? That’s power made at ~$0.14+/kwh. Japan’s electricity prices are in the ~$0.10-12 cent/kwh range today. In 2008, the grid average emissions in Japan were ~.436t CO2/mwh, or ~872 lbs/ mwh. Bloom is not much different from this, only much more expensive, not only to install, but to maintain and generate. Not green or cost competitive, it would seem. It must be nice to have money to blow. Japan seems like a strange market to enter for a natural-gas based electricity generation technology that is a) less efficient than the current combined cycle turbines available, and b) has amongst the highest natural gas prices in the world. Am I missing something? ?